What is Dasanix (Dasatinib) used for? Dasanix is a cancer treatment for chronic myeloid leukemia (CML) and Philadelphia chromosome-positive acute lymphoblastic leukemia (Ph+ ALL). It contains the active ingredient Dasatinib. Dasatinib is a Bcr-Abl tyrosine kinase inhibitor and Src family tyrosine kinase inhibitor. How should I use Dasanix (Dasatinib)? 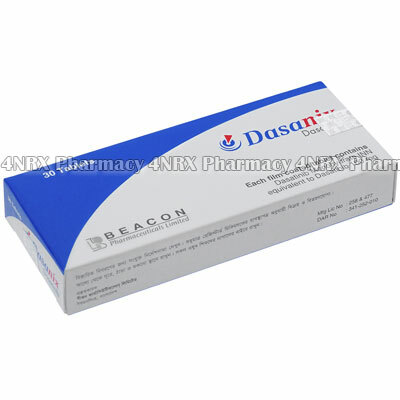 Dasanix is offered as a pack of 30 x 100mg tablets. It is important you take the exact dosage as prescribed by your doctor. You should also follw any other instructions they give such as when to take the tablet, how to take the tablet and for how long to take the tablet. Do not take Dasatinib with grapefruit juice. Do not stop taking your regular dosae of Dasanix unless you are told to do so by your doctor. What are the side effects of Dasanix (Dasatinib)? fluid accumulation in the lining of the lungs (pleural effusion), in the sac around the heart (pericardial effusion) or abdominal cavity (ascites). Tell your doctor immediately if you notice any side effects while taking Dasanix (Dasatinib). Before taking Dasanix, tell your doctor about any other products you are currently taking (including any prescription medicines, over-the-counter products, herbal remedies or nutritional supplements). Some products can interact unfavourably with Dasanix.